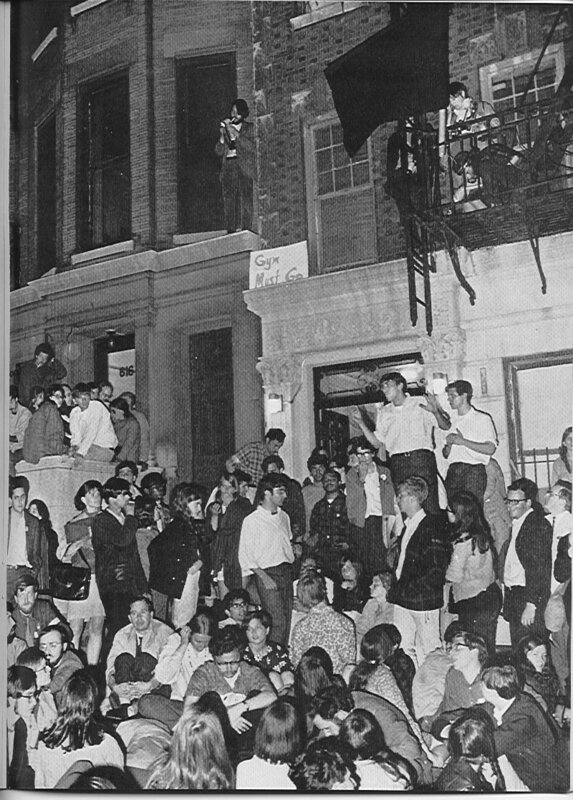 The scene outside 622 West 114th Street between Broadway and Riverside Drive, May 17, 1968, shortly before the police arrived and arrested the people inside, including my college roommate, Peter Marsh, who was pictured on the front page of the next morning's New York Daily News , the police escorting him into a paddy wagon (NEED PHOTO). This was, according to a contemporary source, "a completely rundown tenement that the owner was trying to sell with completely decayed original galvanized plumbing and rotten beams and missing plaster from all the leaks, and had been brutally pushing out the tenants and was down to i think three... my mind is a bit fuzzy about the explicit details, whether cu had already signed the contract to buy or had already taken title to demolish or what. unlike the basically same building at 627 w 115 (the only other such 25 foot walkup tenement around here), which cu salvaged and put to use as staff housing, this was too far gone economically to salvage." On the fire escape, upper right, crouched over his equipment and wearing a headband: Melvin Morgulis, who shot much of the Columbia Revolts footage.